We’re collecting photographs of Germanna names throughout America for a display in the Fort Germanna Visitor Center along with a map with pins of where Germanna descendants live. When you see a Germanna name on something like a sign or outdoor advertisement, take a high resolution photo of it with your phone or camera and send it to our Membership Director Ashley Abruzzo at aabruzzo@germanna.org. We’ll also be posting the photos on Germanna’s social media accounts. 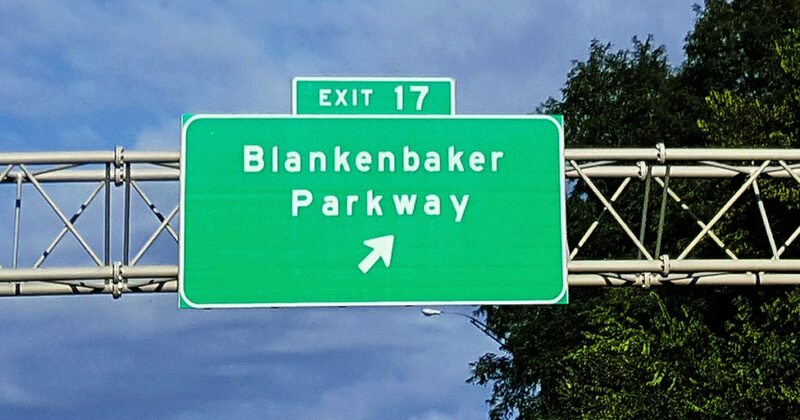 The above is the first photo: Blankenbaker Parkway in Louisville, KY! To help you, here’s a list of all the Germanna names. My 7th generation grandfather, John Kemper, was on the first ship from Siegerland, Germany in 1714 at the age of 19. He married Alice Catherine Utterbach. He settled at Germanna, Culpepper, Virginia. His grandson, John Camper served in Washington’s Continental Army. His great, great grandson moved through Lebanon, TN to Madison County, Alabama. I have the family pedigree on John Kemper. His father, Johann G. J. Kemper was born in Siegerland in 1661 and died in 1731.